The races of this very dangerous snake extend from Western Africa across that continent to Egypt, and east through Asia Minor, Iran, Afghanistan, Pakistan, and India to Sri Lanka (Ceylon). The various populations differ in size and behavior. The deserts of Egypt, Jordan, and Israel are inhabited by the Colored Viper, a related but more beautiful species of limited distribution. 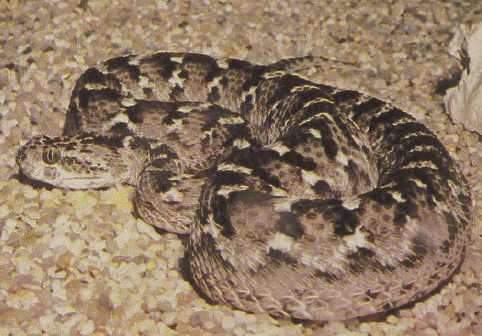 Most populations of the Saw-scaled Vipers are excellent sidewinders that are at home in deserts, where they feed on rodents and lizards. When disturbed, this snake forms itself into an open C-shaped coil and rubs the sides of its body together bringing into contact the saw-toothed scales that give it its name. The rubbing produces a hissing sound that is amplified by the inflated body. Although this viper rarely grows to more than 3 feet in length, it has large teeth and venom that has very high toxicity, apparently quickly dissolving the tissues, and victims report that the bite is exceedingly painful.